Donate to Magnet and transform young lives! Your donation is now tax deductible. Donate to Magnet Theatre today and you will receive an 18A certificate. For details contact us on admin@magnettheatre.co.za. Excited to launch I turned away and she was gone!! 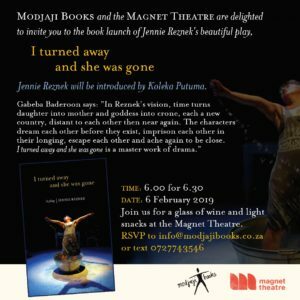 Join Modjaji Books and Magnet Theatre on 6th February @Magnet Theatre for a glass of wine and the launch. 18h00 for 18h30. RSVP to info@modjajibooks.co.za or text 0727743546. IT IS OUT – order the Magnet Theatre book now!! Magnet Theatre seeks to celebrate a spirit of theatrical research and to challenge participants in our activities, performers and audience, through experiences that shift bodies, assumptions, feelings, beliefs and understandings. We strive to be a moving force in the lives and minds of people in relation to changing local and global contexts. Our mission is to create an original repertoire of South African productions, inspirational performance events and effective educational processes that emphasise the primacy of the human body in the act of theatre. Through explorations of our historical, contemporary and stylistic contexts we dedicate ourselves to raising levels of resources and energising audiences and theatre practitioners in the community at large.